A chance meeting between two childhood friends helped one begin a journey back from drug addiction after many years living on the street. It was early October and Wanja Mwaura, 32, was on her way to the market in Lower Kabaete, not far from Nairobi, when she heard someone shout out her name. She looked up and was surprised to see a tall man with bulging eyes, an emaciated frame, dirtied black overalls and an equally stained thick woollen hat, sitting on the side of the road. She did not recognise him. 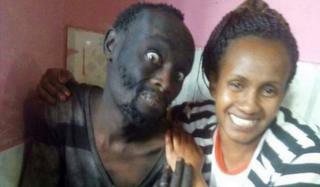 But when Patrick "Hinga" Wanjiru, 34, introduced himself, Wanja says she found herself in shock. Standing before her was a friend she had known since she was seven years old. "Patrick, or Hinga as we called him, and I had met at primary school in 1992," says Wanja, who is a nurse from Kiambu County, just outside the Kenyan capital. "Hinga used to be a great soccer player all throughout school. We nicknamed him 'Pele'." Hinga was estranged from his parents and lived with his grandmother in a squat. When she couldn't afford to pay his school fees, he was forced to skip classes. Eventually they were evicted even from the squat. But against all the odds, Hinga did well in his exams, until his grandmother died - then he dropped out of school and his life began to take a downward trajectory. Hinga started abusing drugs, first marijuana and then heroin. He spent hours sifting through garbage to find things he could sell on the streets. Hinga and Wanja lost touch. When they met again, more than 15 years later, Hinga had been homeless for more than a decade. He looked nothing like the childhood friend who had once been known as "Pele". Sensing Wanja's dismay, Hinga reassured her that he had only wanted to say hello. She asked him if she could buy him lunch. At a local cafe, she ordered the dish she remembered had been his favourite years earlier - pork ribs and mashed potatoes. She said he appeared distracted, unable to finish sentences. "I gave him my mobile telephone number and told him to call me if he needed anything," Wanja says. Over the next couple of days, Hinga borrowed phones and would regularly call his childhood friend, often just to hear her voice for a chat. He told her that he was committed to getting clean from drugs. "I decided then, that something needed to be done to help him," Wanja says. Taking to social media, Wanja appealed to her friends to see if she could raise funds for drug rehabilitation. "Rehab here is very expensive and I had no ways of raising funds on my own," she says. "We set up a crowdfunding page, but we only managed to raise around 41,000 Kenyan shillings (£300) initially. However the cost of nine days rehabilitation at Chiromo Lane Medical Center in Nairobi was more than 100,000 KES. "I wasn't sure how we would be able to cover this." But Wanja had promised to help Hinga, so she took him to the centre anyway, unsure how they would cover the cost. A spokesperson for the rehab programme says Hinga was a dedicated patient, who committed fully to the nine-day detox. Within days Hinga had gained weight and his concentration improved. Wanja took to Facebook to speak about her pride at her friend's transformation in such a short period of time. "A week ago Hinga and I couldn't hold a normal conversation without me trying to hold his head up with my hand in order for him to concentrate. Today we can have a normal conversation with him confidently looking at me," she wrote. Mombasa businessman Fauz Khalid spotted Wanja's public post on Facebook and said he wanted to share the story on a wider platform. He posted the photos on Twitter and his post has now been shared more than 50,000 times. After that, the Kenyan media began to cover the story and Chiromo Lane Medical Center agreed to waive the entire fee for Hinga's treatment. Wanja says this was "a blessing", but she was keen for her friend to undergo a more sustained recovery, and is now raising funds for him to follow a 90-day programme at The Retreat Rehabilitation Centre, where he is currently staying. "Unfortunately, there is still great stigma around drug abuse in Kenya," Wanja says. This may be one reason why the government doesn't provide free drug rehab treatment. "Rehabs are expensive and out of reach for many people, not only in Kenya but also the greater part of Africa. I am committed to crowdsourcing so I can support my friend at this time," says Wanja. "Wanja is an angel sent from God. I owe her my life. She has stuck with me more closely than a brother or a sister," Hinga tells the BBC. On Twitter several users echoed this sentiment. Abraham Wilbourne‏, a financial analyst from Nairobi, told Wanja "You have a seat in heaven!" Many called her a "mashujaa", which means "hero" in Swahili. "People say I changed Hinga's life, but he changed mine too." says Wanja. "I realise now that a small act can change a person's life."